I was never a Seinfeld superfan, but it is pretty much impossible to avoid the show, so I've probably seen close to two-thirds of the episodes. There are lots of funny moments and quotable lines, but one of my favourites is George Costanza's fear about his worlds colliding. This is usually only a concern if you're a different version of yourself at work than you are at home (or whatever), and to be honest, I embrace it when my worlds collide, because it's too much work to keep things separate. In this case, I suppose it's my blog worlds that are colliding. In addition to Books Under Skin, which I've been maintaining for nearly three years, I also have a more traditional life-y blog (mostly about knitting, but also cooking, travel, etc.). I have no plans to merge these blogs (or start reviewing pattern books), but a book did recently cross my desk that fit both blogs too well to pass up. 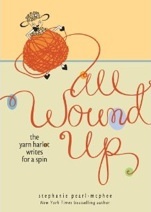 Stephanie Pearl-McPhee's All Wound Up is a collection of memoir-style short stories, wonderfully written and thoughtfully organized, and largely about knitting. It's a bit niche, I'll admit, but All Wound Up is hilarious, and since much of the stories Pearl-McPhee tells involve her adventures parenting three teenage daughters (something my parents would relate well to, I suspect), you absolutely do not have to be a knitter to enjoy her work. I often read books about cultures, places, time-periods, and professions I have no experience with, and I enjoy them very much. Those books are a way for me to engage with something I would otherwise be cut off from; certainly, when I read a book set in a town or city I know well, I feel a different connection to it than I would if it were set somewhere I've never been, but in both cases, if the writing is good and the story is compelling, that added knowledge is just a bonus, not a necessity. So it is with All Wound Up, which made me laugh a lot – sometimes with the half-guilty laugh that comes when you recognize yourself in a situation, but more often because Pearl-McPhee can somehow make everything seem fresh and funny, and do so without being in the least bit mean-spirited. Take, for example, her story about one hot summer day when her daughters were 9, 7, and 4. They were bored and totally uninterested in any of the games and activities she suggested. She left them alone and then, when the house was silent, relished in her successful parenting. When she heard laughter and little giggles, she was pleased to have raised children who could all get along. When the laughter got louder and more rambunctious, she realized there was a problem. Down the stairs she ran to find that her three daughters were having a water balloon fight in the living room. Everything was soaked and dripping and, without spoiling the end (which is incredible and deserving of its legendary status), let me just say that my jaw dropped. I imagine what my parents would have done if my sisters and I had tried such a thing, and I think of what she did, and I just – well, lets just say that sometimes I am awe of how parents handle stress. And also that they're able to talk about it later. Of course, there are also stories about knitting (she isn't a knitting humourist for nothing). One that stuck out for me was her break-up letter to a sweater that just wasn't working out. Everyone has had a project that, try as they might, want it however much they did, there was a point when they realized it was never going to be as wonderful as it was in their head. I suspect this happens to a lot of people who watch home decorating shows in which wall murals are made to look like simple ways to revitalize a room. There are lots of times when something has seemed straightforward and logical in my head and then, when I go to do it, is suddenly unwieldy and absolutely not what I anticipated. That break-up letter? Yeah, it's how that felt. Even better, it's a kind of declaration that says it's okay to stop doing a project that you hate, that isn't turning out well, because your leisure activities are supposed to be enjoyable. I read All Wound Up after I got home from my vacation. I was up early in the morning because of my jet lag, and where I suspect I would have been really ticked about that in another context, I relished the time I would get to spend reading Pearl-McPhee's stories. 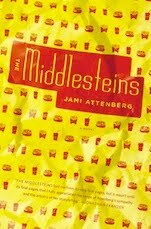 In a lot of ways, her writing reads like having a coffee (or beer) with a friend – the kind of occasion that is just escalating stories and fits of laughter, and generally a great time. It's my favourite kind of humour writing because, while it's light and enjoyable, it isn't fluff. Pearl-McPhee's stories are the kind you want to retell to your friends, both so they can enjoy a laugh, but also because they're all about something specific and unique, and just the sort of think you'll want to revisit yourself.